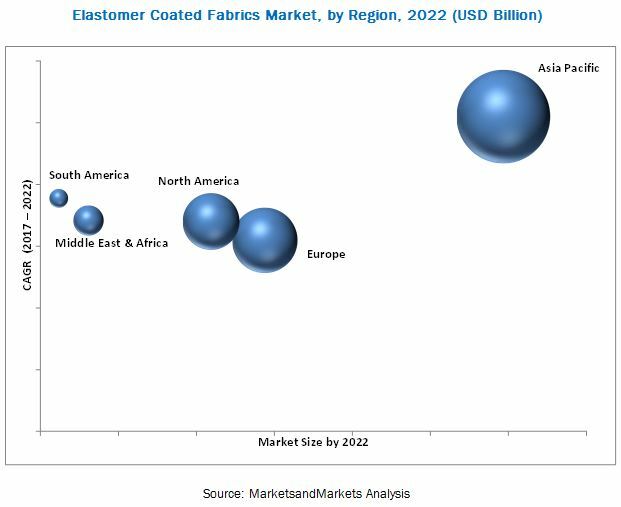 [186 Pages Report] Elastomer Coated Fabrics Market size was valued at USD 9.33 Billion in 2016 and is projected to reach USD 11.85 Billion by 2022, at a CAGR of 4.16% during the forecast period. The base year considered for the study is 2016, and the forecast period is from 2017 to 2022. Both, top-down and bottom-up approaches were utilized to estimate and project the size of the elastomer coated fabrics market. The size of the elastomer coated fabrics market was calculated, and weightages were assigned to various market segments. This was performed on the basis of extensive primary interviews and secondary research based on the information available on websites of various associations, such as The Chemical Fabrics and Film Association (CFFA), Industrial Fabrics Association International, and Association for Contract Textiles (ACT). 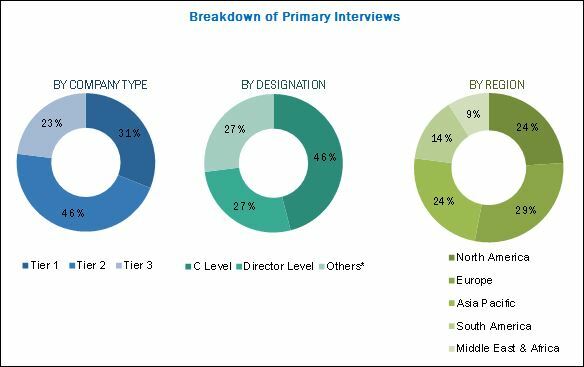 Primary research included extensive interviews with key personnel such as CEOs, VPs, directors, and executives. After arriving at the overall market size, the total market was split into several segments and subsegments. The data triangulation and market breakdown procedures were employed to complete the overall market engineering process and arrive at the exact statistics for all segments and subsegments. The breakdown of profiles of primary respondents is depicted in the figure below. The ecosystem of the elastomer coated fabrics market comprises manufacturers of coated fabrics, such as Takata (Japan), Trelleborg (Sweden), Spradling International (US), Serge Ferrari (France), Saint-Gobain (France), Sioen Industries (Belgium), Continental AG (Germany), Seaman Corporation (US), and SRF Limited (India). Elastomer coated fabrics are majorly used in transportation, protective clothing, industrial, roofing, awnings & canopies, and furniture & seatings applications. “This study answers several questions for the stakeholders, primarily, which market segments to focus in the next two to five years for prioritizing efforts and investments”. This report categorizes the global elastomer coated fabrics market based on product, application, and region. The market size of elastomer coated fabrics is estimated to reach USD 9.67 Billion in 2017 and is projected to reach USD 11.85 Billion by 2022, at a CAGR of 4.16% from 2017 to 2022. The global elastomer coated fabrics market is driven by increased demand from end-use applications in such as transportation, protective clothing, industrial, furniture & seating, and roofing, awnings & canopies, and others. Elastomer coated fabrics are anti-static, antibacterial, and anti-fungus in nature and offer advantages such as enhanced elasticity, high visibility, weldability, and resistance to flame, UV radiation, chemical, oil, water, stain, scratch, and abrasion. Based on product, the elastomer coated fabrics market is segmented into silicone coated fabrics, TPU coated fabrics, TPO coated fabrics, and rubber coated fabrics. Silicone coated fabrics possess high-performance properties such as excellent adhesion, enhanced wetting, foam control, viscosity, abrasion, chemical and weather resistance, waterproofing, water vapor permeability, and high temperature stability. Transportation is estimated to be the fastest-growing application segment of the elastomer coated fabrics market. The transportation segment is projected to drive the elastomer coated fabrics market from 2017 to 2022 due to the increasing usage of elastomer coated fabrics in automobile, aircraft, railways, and marine. The automotive industry is already growing at a robust pace, which is expected to drive the market of elastomer coated fabrics during the forecast period. Elastomer coated fabrics are appropriate for a wide range of automotive end-uses such as interior, exterior, air bags, seat belt, and truck tarpaulin & covers, boat seating, boat topping, rafts, and kayaks. Asia Pacific is the fastest-growing market for elastomer coated fabrics in terms of value and volume, globally. Growing industrialization that is backed by infrastructure development has offered enormous growth opportunities for the elastomer coated fabrics market in Asia-Pacific. The increasing economic growth rate and heavy investments in industries such as oil & gas, automotive, infrastructure, chemical, and steel & military drives the elastomer coated fabrics market in the region. Environmental concerns relating to the use of solvents in the elastomer coated fabrics production and the availability of substitutes are the factors restraining growth of the market. New products and services launches were the major strategies adopted by most players in the market. Companies such as OMNOVA Solutions (US), Takata (Japan), SRF Limited (India), Serge Ferrari (France), Seaman Corporation (US), Continental AG (Germany), Spradling International (US), and Trelleborg (Sweden), were the key players who adopted these strategies to increase their product offerings and strengthen its customer base. 11.12 Anhui Anli Material Technology Co., Ltd.